Located in the Portes du Soleil, technically the world’s largest ski area, the resorts of Morzine and Les Gets offer access to some of the best ski terrain around, as well as breathtaking scenery from every angle. The winter brings plenty of snowfall, creating an alpine paradise for skiers and non-skiers alike. During the summer you can spend the day swimming in nearby Lake Geneva or exploring the expansive mountains on foot or by bike. 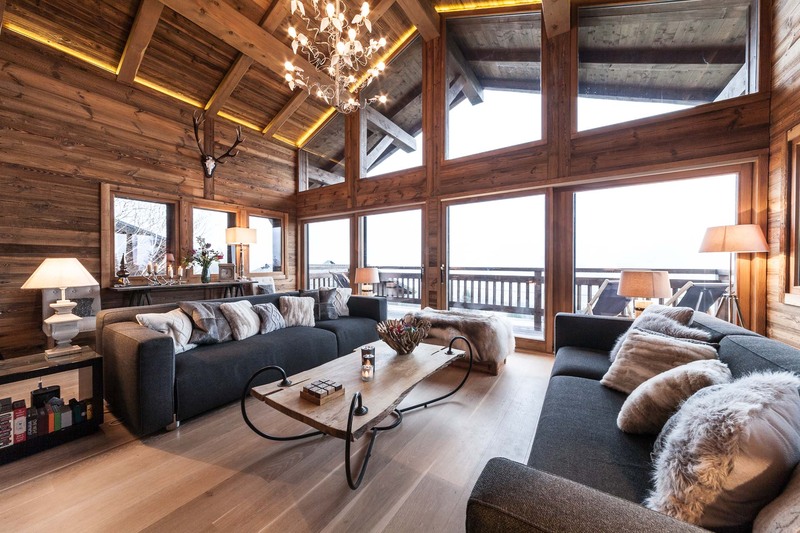 Morgan Jupe operate a selection of boutique chalets in the region, offering a range of luxury self-catered, flexi-catered and fully-catered accommodation. Catered packages provide guests with the chance to indulge in delicious home-cooked meals, daily housekeeping and an all-day local driving service. Owners Jess and Josh place guests’ needs at the heart of everything they do, ensuring that everyone they welcome receives the highest possible standard of customer service and an unforgettable stay in this beautiful region. Located 500 metres from the “Folliets du Golf” chairlift and with direct access to the “Bruyeres” piste in Les Gets, Chalet Louis is the ideal accommodation for a family ski holiday. 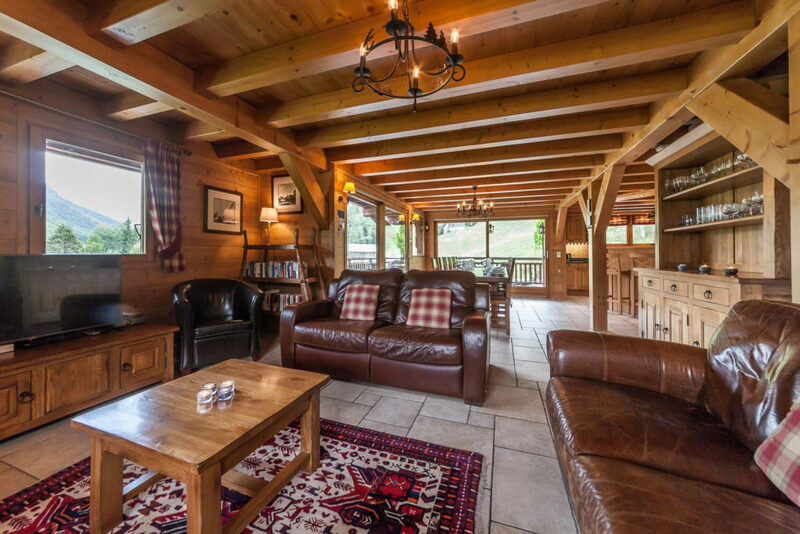 Chalet Louis is perfect for those travelling with children as it features two double bedrooms (for adults), two twin bedrooms and one bunk bedroom. Four of the five bedrooms feature en-suites. 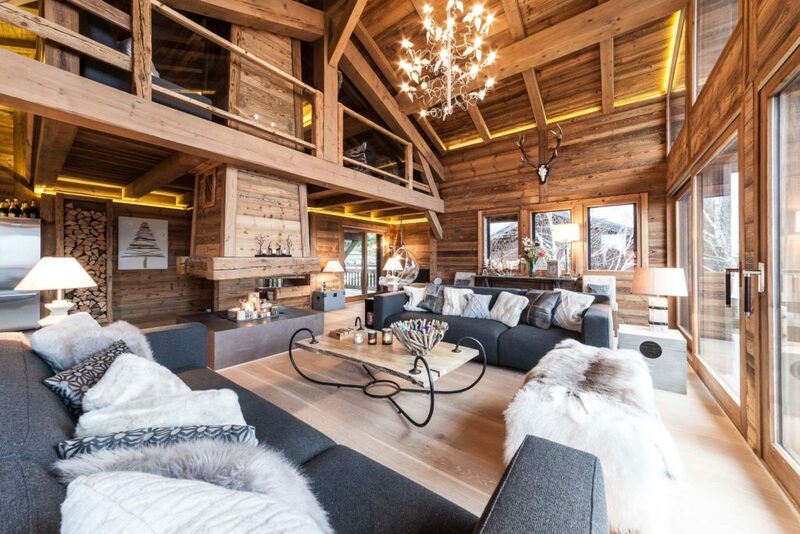 After a day on the slopes, kids can burn off extra energy running around the spacious, open-plan living room, kitchen and dining area or watch their favourite movies on the Apple TV in the “snug”. Adults will enjoy a long soak in the brand new outdoor hot tub or relax in front of the central “suspended” log burning fireplace. Skiers of all ages will appreciate the dedicated ski/boot room with electric boot heaters. 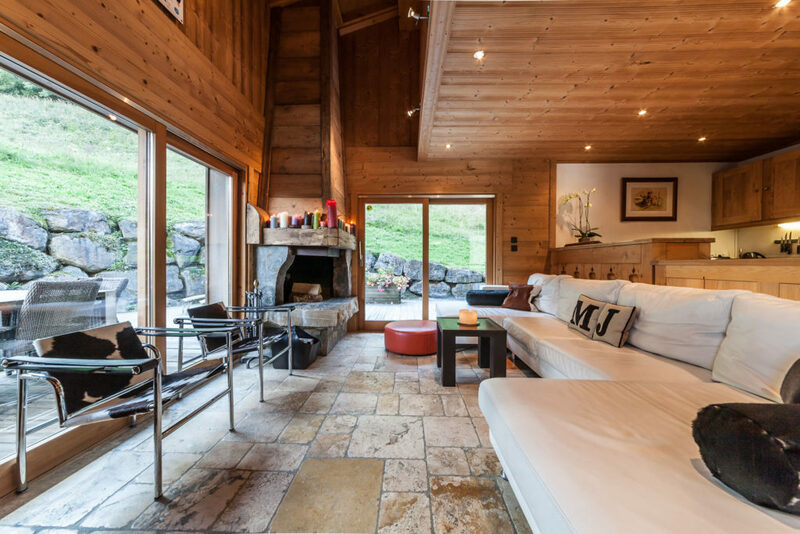 With direct access to the “Retour des Nants” piste, Chalet de mes Reves is the ideal chalet for a winter ski holiday with friends. 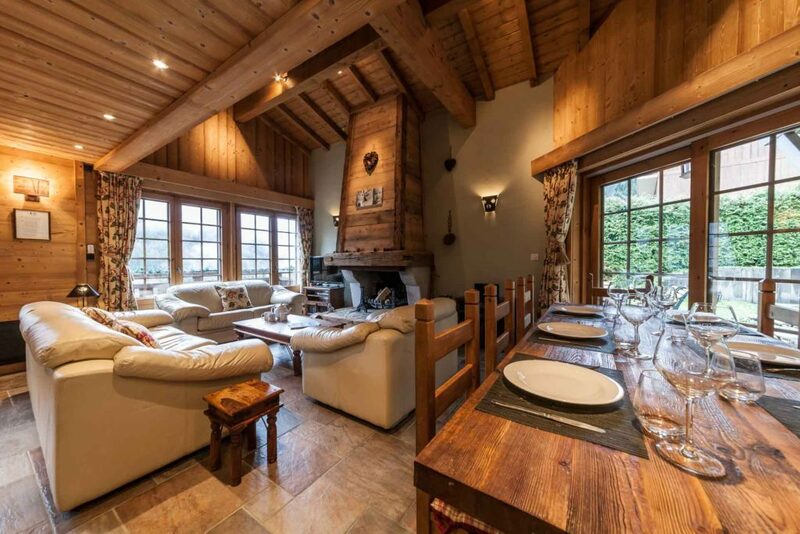 Chalet de mes Reves can comfortably sleep eight adults and features four double bedrooms, one single bedroom and four bathrooms. After an active day on the mountain, you can enjoy a leisurely soak in the outdoor hot tub, chill out in the lounge with a large TV and PlayStation or curl up in front of the large wood-burning fireplace with your favourite book. Skiers will especially appreciate the dedicated ski/boot room with electric boot heaters for warm and toasty boots. 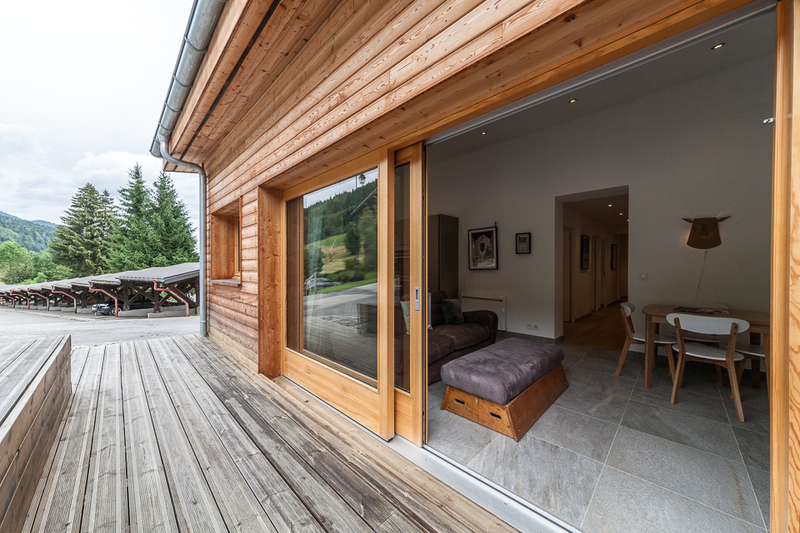 Situated just outside the quaint village of Morzine, Chalet Chardon comfortably sleeps eight adults and features four double bedrooms and one single bedroom, each with a private or en-suite bathroom. You can ski-in from the “Retour des Nants” piste making it the ideal choice for a couples’ ski holiday. After a day on the slopes, you can relax in the luxurious outdoor hot tub or by the large wood-burning fireplace. Skiers will also appreciate the chalet’s dedicated ski/boot room with electric boot heaters and a dedicated massage room. 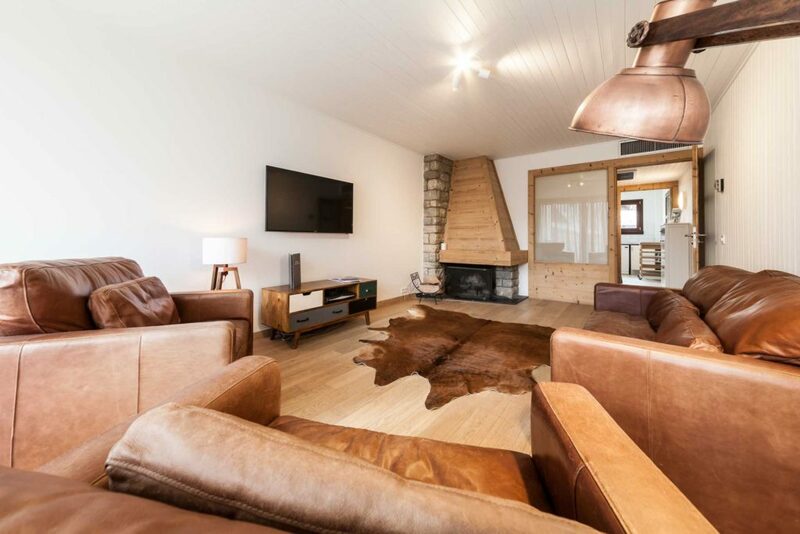 Morgan Jupe’s largest chalet, Chalet des Amis comfortably sleeps twelve guests with its three double bedrooms, one twin bedroom, one quad bunk bedroom, all with en-suites or access to a shared bathroom. After hitting the slopes, adults can rest sore muscles with the outdoor hot tub or indoor sauna, while kids enjoy the large TV and Xbox 360 in the ground floor games room. Gather the family around the large wood-burning fireplace and dine in style with views over the nearby valley. 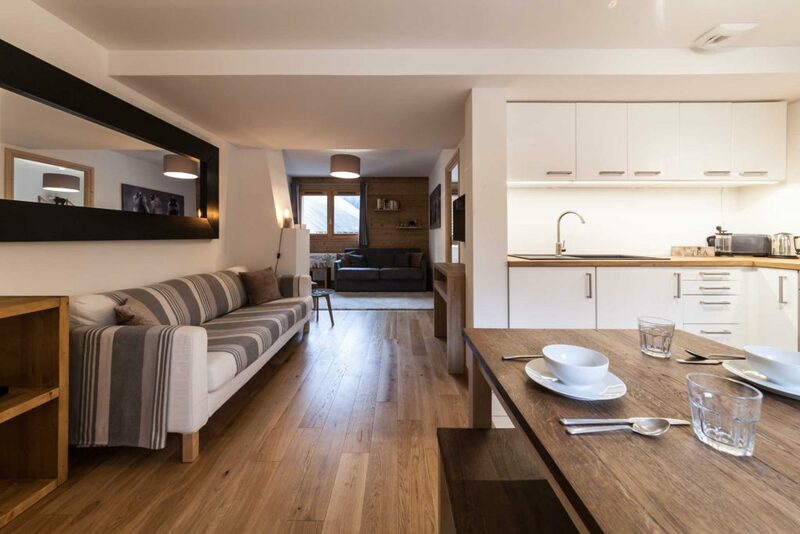 Located in Morzine town centre, this self-catering apartment comfortably sleeps four, featuring two flexible double/twin bedrooms and one bathroom. Take advantage of Morzine’s extensive selection of restaurants and local pubs or cook a homemade meal in the spacious kitchen. Both the town centre and Super-Morzine gondola are only a five-minute walk from the apartment. For larger groups looking for access to Morzine town centre and the ski slopes, this ground floor self-catering apartment at the foot of the pistes is the ideal choice. It comfortably sleeps six and features two double bedrooms, one bunk room and two bathrooms. You’re guaranteed a pleasant stay as the apartment is fully equipped with Sky TV, Sonos sound system, Wii console, and of course Wi-Fi. You’ll also find a tumble dryer and boot heaters, ideal for making sure you’re ready for another day of epic skiing. Located just five minutes walk from Morzine centre and 100 metres from the piste, this self-catering apartment is the ideal choice for families with children or small groups of friends. It comfortably sleeps four guests between the double en-suite bedroom and twin bedroom with separate bathroom. You can cook evening meals at home in the fully-equipped kitchen and relax with your favourite movie on the smart TV. There’s also an electric boot heater to make sure you’re ready for another fantastic day on the slopes.